Hunrichs, Richard A.; Pratt, David A.; Meyer, Robert W. , 1998. Magnitude and frequency of the floods of January 1997 in northern and central California; preliminary determinations. U.S. Geological Survey ; Information Services, Open-File Report 98-626, v, 120 p. :ill., maps ;28 cm. Kaehler, Charles A.; Pratt, David A.; Paybins, Katherine S., 1997. 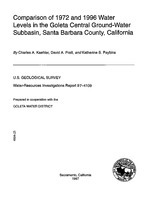 Comparison of 1972 and 1996 water levels in the Goleta central ground-water subbasin, Santa Barbara County, California. U.S. Geological Survey ; Information Services [distributor], Water-Resources Investigations Report 97-4109, iv, 31 p. :ill., maps ;28 cm. 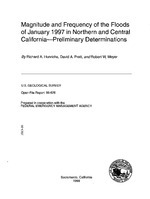 Hunrichs, Richard A.; Pratt, David A.; Meyer, Robert W.
Magnitude and frequency of the floods of January 1997 in northern and central California; preliminary determinations; 1998; OFR; 98-626; Hunrichs, Richard A.; Pratt, David A.; Meyer, Robert W.
Kaehler, Charles A.; Pratt, David A.; Paybins, Katherine S.
Comparison of 1972 and 1996 water levels in the Goleta central ground-water subbasin, Santa Barbara County, California; 1997; WRI; 97-4109; Kaehler, Charles A.; Pratt, David A.; Paybins, Katherine S.